Apothecary Shop. Constructed on-site: 1959—. 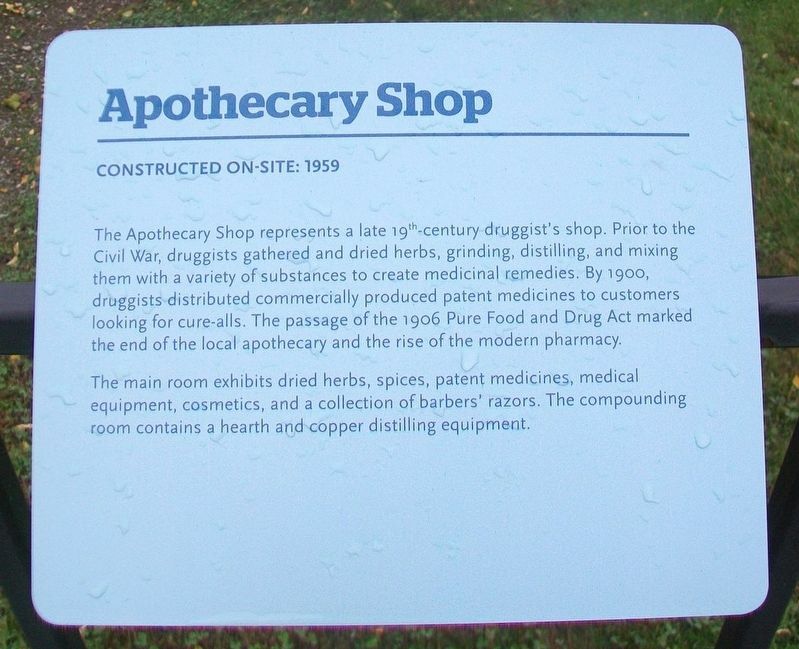 The Apothecary Shop represents a late 19th-century druggist's shop. Prior to the Civil War, druggists gathered and dried herbs, grinding, distilling, and mixing them with a variety of substances to create medicinal remedies. By 1900, druggists distributed commercially produced patent medicines to customers looking for cure-alls. The passage of the 1906 Pure Food and Drug Act marked the end of the local apothecary and the rise of the modern pharmacy. The main room exhibits dried herbs, spices, patent medicines, medical equipment, cosmetics, and a collection of barbers' razors. The compounding room contains a hearth and copper distilling equipment. Location. 44° 22.599′ N, 73° 13.868′ W. Marker is in Shelburne, Vermont, in Chittenden County. Touch for map. 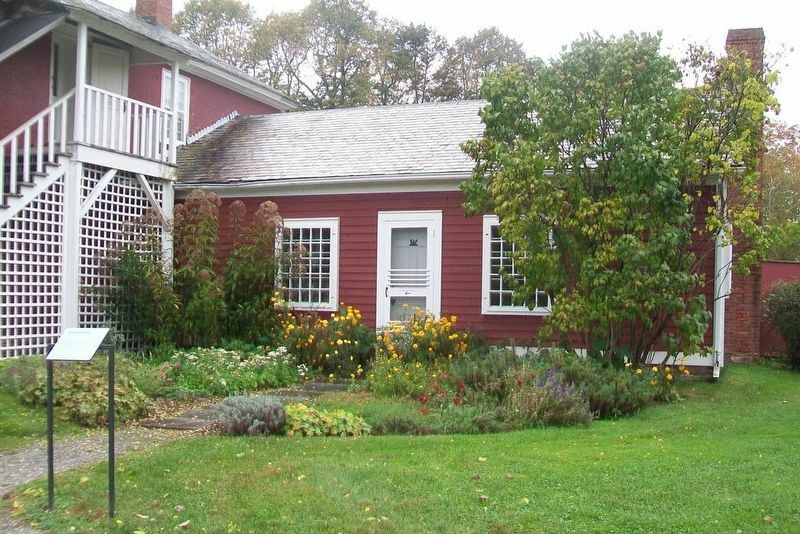 Marker and building are on the Shelburne Museum grounds. Marker is at or near this postal address: 6000 Shelburne Road (US Hwy 7), Shelburne VT 05482, United States of America. Touch for directions. (within shouting distance of this marker); Prentis House (within shouting distance of this marker); Meeting House (within shouting distance of this marker); Blacksmith Shop (within shouting distance of this marker); Vermont House Gallery (within shouting distance of this marker); Dutton House (within shouting distance of this marker); Dorset House (within shouting distance of this marker). Touch for a list and map of all markers in Shelburne. More. Search the internet for Apothecary Shop. Credits. This page was last revised on October 21, 2017. This page originally submitted on October 21, 2017, by William Fischer, Jr. of Scranton, Pennsylvania. This page has been viewed 101 times since then and 5 times this year. Photos: 1, 2. submitted on October 21, 2017, by William Fischer, Jr. of Scranton, Pennsylvania.